Last weekend, I experienced the coldest shooting conditions I’ve ever faced. It really was a shock to my system. The good news is that I walked away with some really dramatic seascapes in the bag. The alarm rung at 2:30am. Having only reached bed at 12:30 I really wasn’t in the humour of making the long drive to the north coast. Luckily, I wasn’t the designated driver on this occasion. A quick glance out the window as I dressed in the dark, confirmed it was snowing hard. A few extra layers of clothes were needed. By 3am, I had reached the rendezvous point and the weather wasn’t looking any better. Excitement started to grow as we drove north in the hope of snowy scenes. Alas, just past Newry the snow died off and we didn’t see another flake all morning. The north-east wind was gathering speed and with a high tide on the North coast there was a strong possibility of big wave action. On arrival at Ballintoy, conditions seemed very quiet. My pre-visualization’s of the harbour taking a hammering from waves were ill gained. In fact, it seemed very calm within. I was now far from optimistic about the chances of creating any dramatic seascapes. 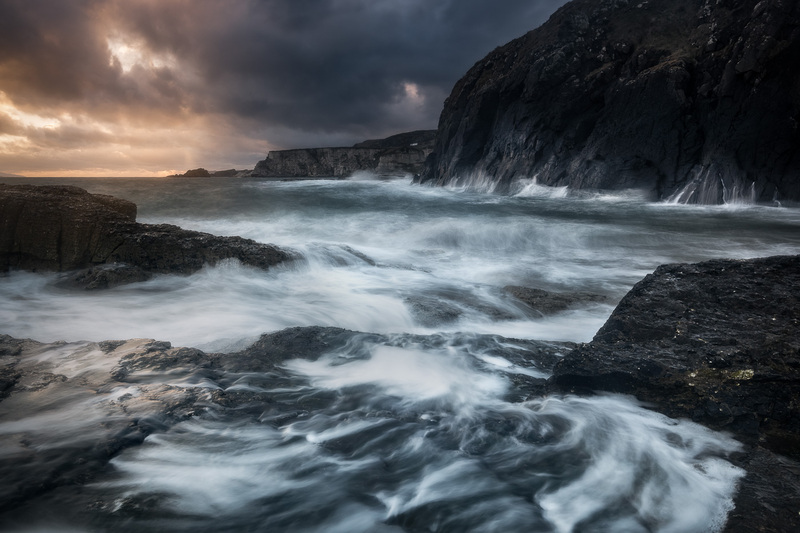 Ballintoy is a great location for seascape photography as it offers a lot of possibilities most of the year. The harbour and coast are about 1 mile long at most but vary greatly with sandy beaches, harbour walls and dramatic rock formations. A popular location, it is a rarity to arrive and not bump into other photographers. Being quite familiar with the location, I didn’t feel the need to get out and start searching compositions. Having sat eating scones, drinking coffee and waiting for the appearance of light we eventually decided to make a move to our intended spot. On exiting the car, the first thing that hit me was the wind chill. Additional layers were added – thermal’s, extra fleeces, even a biker’s face balaclava but to no avail. The cold was crippling. We made our way to the eastern side of Ballintoy for sunrise. I struggled to make an image for over an hour as wave after wave crashed in. The wind, lifted and drove the salty spray. Myself and my camera gear were taking a real hammering. It was hard to focus on the technical issues thank to the extreme cold and the relentless sea-spray. Keeping the filters clean for longer than a second was an impossible task no matter what direction I faced. Totally defeated and frustrated I withdrew away from the water to re-gather my thoughts. The sun was rising fast & the resulting colours in the sky were beautiful. I spotted a potential shot looking to the right but way from the colour. It was the only option left to try here as shooting towards sunrise had proven disasterous. 10 frames later and another withdrawal was required as the waves & spray were still drenching me. Stood watching from afar, the sun rose higher & higher. Some beautiful god beams appeared in the far-off distance and a longer focal length was required to attempt one more composition before retreating to the car. Our faces were red raw from where seasalt blew across them striping the skin. My fingers and toes were numb. I sat clutching a coffee and wondering had I even one clean image from the mornings shoot. At home, I got a pleasant surprise. 99% of the images were useless thanks to the spray. However, the couple of workable images I had were oozing drama from the mornings tough conditions. The freezing cold conditions were soon a distant memory from the comfort of my computer desk. As always, I won’t show the mediocre or poor attempts which will soon be forgotten. One image I like from a shoot is a good return in my book – two is a bonus. If I can impart one piece of advice regarding the capture of dramatic seascapes it is this – venture out in uncomfortable weather to find the drama…. But remember – stay safe! !